Arsenal’s new manager Unai Emery has already notched up an impressive record with the club away from home – at least in comparison to how his predecessor Arsene Wenger fared in his final few months in charge. According to Evening Standard journalist James Benge, the new Gunners boss has overseen the team scoring seven goals in away games this season. 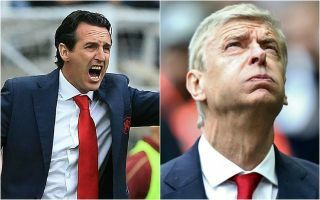 While Arsenal are far from the finished article under Emery, they have shown signs of improvement in recent matches, winning their last three in a row, including back-to-back away wins against Cardiff City and Newcastle. This, incidentally, is the first time Arsenal have won consecutive away matches in the Premier League since May 2017. On top of that, Arsenal also scored twice in a 3-2 defeat to Chelsea earlier this season, taking their tally to seven goals scored in their last three games on the road. Arsenal have scored 7 goals in their first three PL away games under Unai Emery. They scored 7 goals in all their 8 2018 PL away games under Arsene Wenger. Remarkably, that’s the same number the north London giants managed under Wenger in 2018 for the entire final few months of his reign. It’s only a small section of Wenger’s time at Arsenal in all his 22 years at the helm, but it really signifies just how bad things had got for the Frenchman at the end of his time at the Emirates Stadium. Arsenal’s away form was terrible last season but they look like a more convincing outfit at the moment as Emery settles in in England.